Bears like this are not luck. We don't count on luck but we do appreciate a good dose of it when it comes along. Usually hard work tips the luck bucket our way. 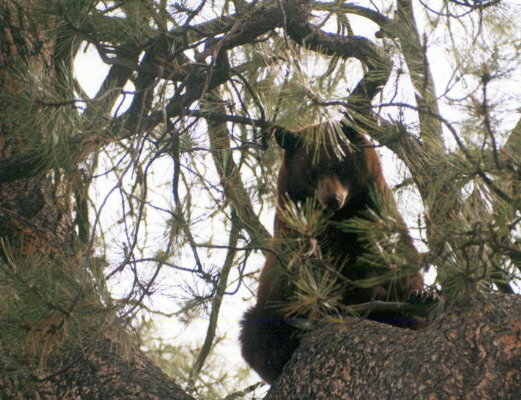 This big brute was one of five we treed in three days on a photo trip. From mid-April to mid-May Utah offers a pursuit season that is ideal for photo trips. The bears are fresh out of their dens and looking for food. Enjoy the bear pages. I had to lower the photo quality due to long download times. Utah's spring bear season was a riot for the Southwest Hounds Crew. The bear were wild and the weather seemed uncooperative at times. Our camp had hounders from Arizona, Utah, Colorado and Idaho. Mixing men and dogs from all over the West and having a continual stream of deer walking through our camp made for some exciting times. We chased some trash, ate like kings, told stories till late and followed dogs from the pines to the sandstone bluffs. All together we, as a camp, caught two bears in four days. The highlight of my hunt was sharing the fire with Van Johnson. We fed him steak and he told us about hunting with Willis Butolf of the Price, Utah area. His story was about recovering a dog that had been stolen and I've never laughed so hard. Another notable hunting pair that came to camp was Mike and Trevor Mineer. They teamed with Van on a bear in the oaks. The video of this catch is incredible. The 150 pounder wouldnt tree and the dogs werent giving him any room to escape. It got Western for a while but the dogs were finally extracted without incident and the bear left in good shape to run again. 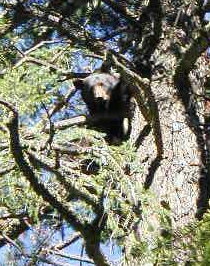 Our last day in camp we teamed up on a bear in the pines. He fought off the pack and we called in for more support. The next group of dogs found and bayed him up in a shallow canyon surrounded by private property. The landowners seemed amused that the dogs were carrying on so but were reluctant to give us permission to get more dogs to the fight. We did the best we could but the bruin was intent on running us off the mountain. Oh, what a chase. He went past plenty of climbing trees and finally bayed up in the sandstone cliffs just above the sage covered desert. We encountered big cedar bucks, monster bull elk and a couple of rattlesnakes along the canyon rim as we worked down to the getting spot. What a thrill it was to hear hounds roaring in the canyon and look across at them bayed up close. The previous days running had them nearly worn out but they were trying hard to keep the black boy in the shade. He was so majestic with his black coat shinning in the South Utah sun. We guessed him to be 350 pounds and he looked like he had wintered well. The hounds would creep closer, screaming at him all the while. He'd let them come for a while and then scatter them with a sudden rush and move to another spot. Trevor got two more dogs onto him as he passed 25 yards away but even with the additional help this bear was in control. Mothers Day wouldn't wait so we gathered dogs and packed up. The bears were much harder to catch this year. We talked to a lot of other hunters and all seemed to have the same problem. These bears wouldn't tree. What more could one want from a training season? The night chill froze the dogs water but the afternoon sun warmed to 90 degrees. Most of the ponds are low or dry and unless some rain blesses us it will be a long, hard summer. Arizona Update- I was recently given a copy of a proposal submitted to the Arizona Game and Fish Commission and Director from Schubert & Associates who represent the Animal Defense League of Arizona and The Fund for Animals. In it they start out asking that all bear and lion hunting be eliminated and in the last synopsis they ask to close lion season for 6 months out of the year, prohibit hunting bear and lion with hounds (bring on the cur dogs), eliminate the spring bear hunt. Of course they explain that hunting isnt necessary because lions and bears have self-regulating populations and I quote, male lions and bears establish territories that are larger than those established by femalesYoung and/or transient lions and bears may succumb to intra-specific aggression, starvation or other forms of mortality if they invade and established territory. End quote. Now I'm a redneck from the backwoods of Arizona but this sounds to me like the animal lovers would gladly have the young culled by adult males in an effort to protect the limited food supply or simply to bring the female back into heat so another breeding could take place but dont take those barking dogs into the woods and tree or chase one of these cuddly friends. I won't try to defend the use of hounds in this arena but in talking to the Michael Golightly, Chairman of the Commission and Brian Wakeling of the Game Branch I will say that the general voting public needs to have some positive experiences with hound hunters for us to protect our hunting from a ballot initiative. What I'm suggesting is that we might further our cause and continue to pursue with hounds longer if we approach hunting like the bass fishermen have. CPR would be a good acronym, Catch, Photograph and Release. Just a thought but I've got a bear rug or two and even a lion, how many more need hit the ground just so I can have one more. I recently completed a video of bear hunting with hounds and I never tire of watching two of the bears we released climb down and run away. I'm not suggesting that we quit killing bears or lions, just let some go now and again, the deer herds will survive.